Peptide (C)DAVRLREVQGKDGGE, corresponding to amino acid residues 495-509 of rat VAChT (Accession Q62666). Cytoplasmic, C-terminus. 1,2. Anti-Vesicular Acetylcholine Transporter (VAChT) Antibody (#ACT-003), (1:200). 3,4. Anti-Vesicular Acetylcholine Transporter (VAChT) Antibody, preincubated with the control peptide antigen. Immunohistochemical staining of perfusion-fixed frozen rat brain sections using Anti-Vesicular Acetylcholine Transporter (VAChT) Antibody (#ACT-003), (1:400), followed by goat-anti-rabbit-AlexaFluor-488. A. VAChT staining (green) in rat medial septum is detected in neuronal soma (arrows). 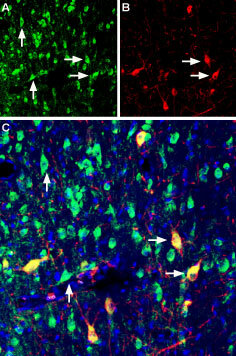 B. Staining of spinal cord sections reveals VAChT labeling in neuronal soma (arrows). Cell nuclei are stained with DAPI (blue). Bravo, D.T. et al. (2004) J. Neurochem. 91, 766.
de Castro, B.M. et al. (2009) Mol. Cell. Biol. 29, 5238. Nguyen, M.L. et al. (2000) Biochemistry 37, 13400. Parsons, S.M. (2000) FASEB J. 14, 2423. Masson, J. et al. (1999) Pharmacol. Rev. 51, 439. In cholinergic neurons, acetylcholine is synthesized from choline and acetyl-coenzyme A (acetyl-CoA). Vesicular acetylcholine transporter (VAChT) transports acetylcholine from the cytoplasm to the lumen of synaptic vesicles where following depolarization, acetylcholine is released in the synaptic cleft and activates muscarinic and nicotinic receptors located on postsynaptic membranes1-3. Acetylcholine released in the synaptic cleft is rapidly hydrolyzed into choline and acetate. Since choline is not de novo synthesized and thereby only made available through diet uptake, choline is recycled back into the cells in order to regenerate acetylcholine1,2. VAChT is a member of the SLC18 family of transporters. It has 12 membrane spanning domains, with extracellular N- and C-terminal tails. The transporter exchanges cytoplasmic acetylcholine for two vesicular protons4-6. VAChT is a selective marker of cholinergic neurons and could be used therefore to determine the loss of cholinergic neurons in Alzheimer’s or Alzheimer’s related disease7. VAChT knockout mice die after birth. They display a lack of stimulated release of acetylcholine and an underdeveloped neuromuscular junction4. Anti-Vesicular Acetylcholine Transporter (VAChT) Antibody (#ACT-003) is a highly specific antibody directed against an epitope of the rat protein. The antibody can be used in western blot and immunohistochemistry applications. It has been designed to recognize VAChT from mouse and rat samples. The antibody is not suited to recognize VAChT from human samples.